A win on Saturday night would be one of the biggest moments for Amir Khan – not just in his career, but also in his life. Khan is a tremendous underdog, against a boxer that many view as one of the top pound-for-pound fighters in the sport. A victory, Khan admits, would be a massive achievement in the eyes of the boxer. 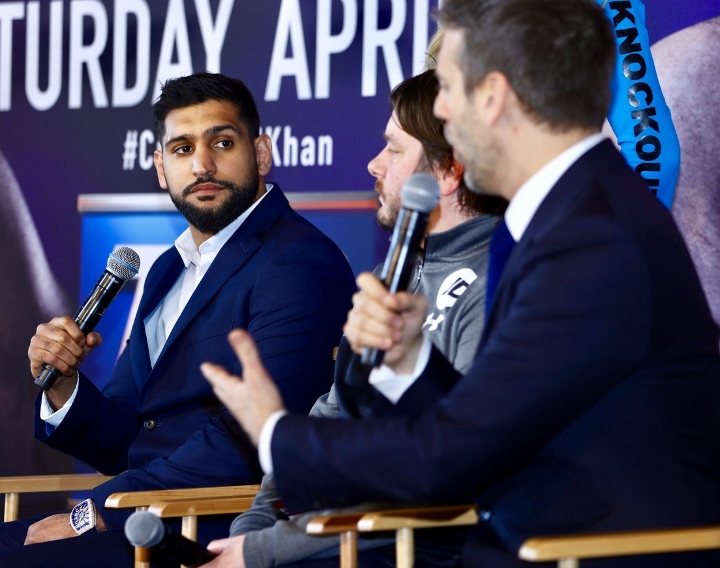 Khan would regard the win over Crawford as being a bigger life event than his own wedding day. “My wife will kill for me this but I have to say yes. Definitely. This fight means so much to my legacy,” Khan told Daily Mail. Khan was last in the ring back in the fall of last year, when he had some struggles in winning a twelve round decision over Samuel Vargas. Khan was dropped in the bout and then hurt in the late rounds. He also had Vargas down, twice. The struggles against Vargas, who recently lost a decision to aging veteran Luis Collazo, made Khan an even bigger underdog – due to the ongoing doubts about his ability to take a good punch. For that contest, Khan was being trained Joe Goossen, and now the Bolton boxer has reunited with veteran coach Virgil Hunter, who last year took a break due a serious medical condition.